Quest for the Arab Startup Formula: Latest in advertising... check your egg! 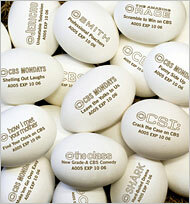 Latest in advertising... check your egg! The network plans to announce today that it will place laser imprints of its trademark eye insignia, as well as logos for some of its shows, on eggs — 35 million of them in September and October. while this seems bizarre at first glance, ... it's not that of an idea. what do you think?